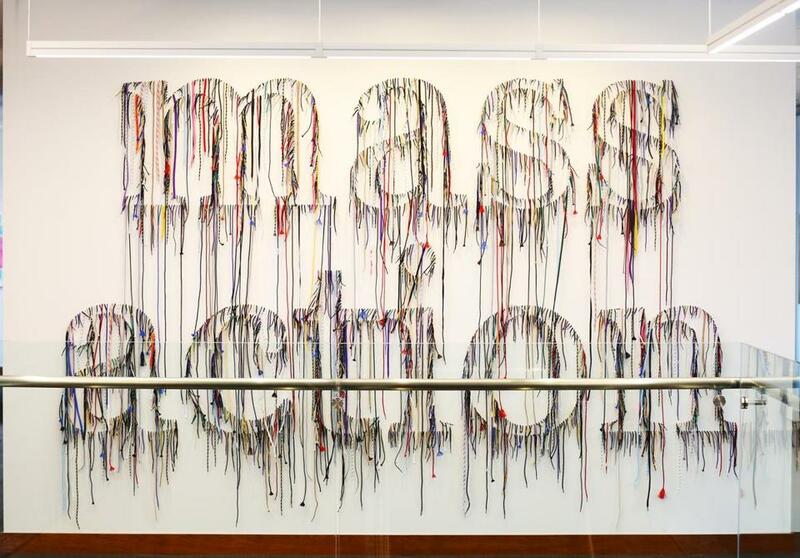 “Mass Action,” made up of shoe strings, was created by artist Nari Ward. It’s a nod to Barr’s commitment to collaboration, much of it taking place in Massachusetts. Barr – set up in 1997 by Continental Cablevision cofounder Amos Hostetter Jr. and his wife, Barbara – has become one of the region’s most influential foundations, with assets of $1.7 billion. The Pilot House on Lewis Wharf has been Barr’s longtime home, and in 2017, the organization more than doubled the size of its office by taking over an adjoining fourth-floor space at Two Atlantic Avenue. Barr needed more room because its staff has increased to 31 from 19 as the organization’s grantmaking budget has grown significantly. This year, Barr will give out $85 million, up from $59 million in 2014. Barr president Jim Canales said the foundation wanted the work space to inspire staffers, grant recipients, and other visitors. That’s a key reason why artwork is on display throughout the building. There are so many pieces — by 18 artists in all — that the collection has its own section on Barr’s website. Funding of the arts is central to Barr’s mission, and when it comes to adorning the walls, the foundation has focused on bringing in pieces from living contemporary artists whose works range from photography to paintings to a mural. 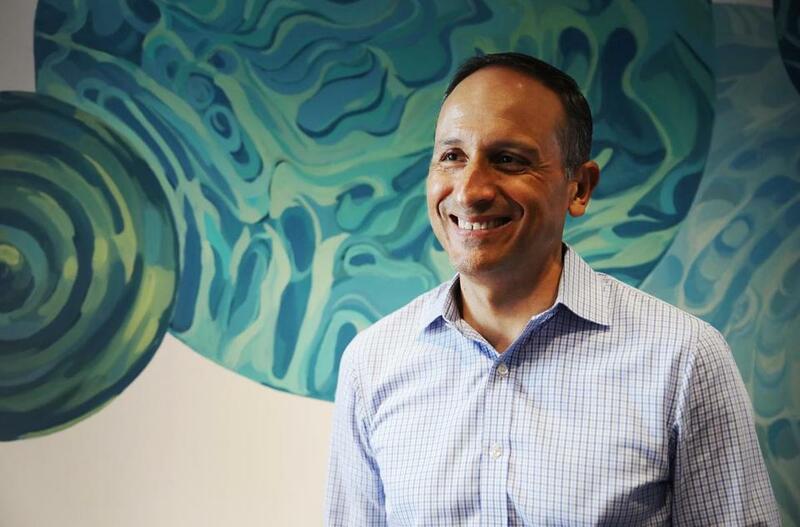 Jim Canales, president of The Barr Foundation, stands next to a mural painted by Boston based artist Silvia López Chavez. Barr commissioned a mural by Boston artist Silvia López Chavez that takes over the walls of an otherwise mundane conference room. Titled “Rhythmic Nimbleness,” Lopez Chavez worked with Barr staff to identify concepts for the mural: nurturing, potential, collaboration, open and nimble. Lopez Chavez chose a light blue palette and rounded forms to suggest the movement of water and signify Barr’s desire to be transparent and fluid, and to have a ripple effect on the community. Just outside of that conference room is a dramatic living wall of 128 potted plants. You really have to see it in person to appreciate this collection of ferns, pothos, and bromeliads. Walk by, and a sense of calm washes over — you feel like you’re breathing easier, if not fresher, air. Fighting climate change is another Barr focus, and the wall of plants reflects its effort to protect the environment. 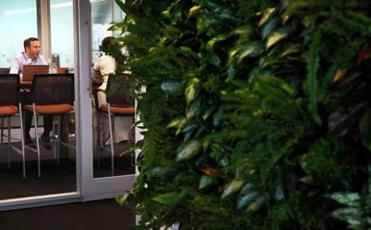 Employees of the The Barr Foundation work in their Back Bay Boston based office next to a live plant wall. Barr’s office offers impressive views of Boston Harbor — a vista that also serves as a constant reminder of the nonprofit’s keen interest in the downtown waterfront. Over the past two years, Barr has doled out more than $11.4 million in grants to 13 groups to work on everything from making the waterfront more accessible to resiliency programs. After the redesign and expansion, Canales eschewed a traditional corner suite. He’s still got some nice digs, but they’re more toward the center of the action. His office is full of objects, small and large, that remind him of Barr’s mission as stewards and catalysts. 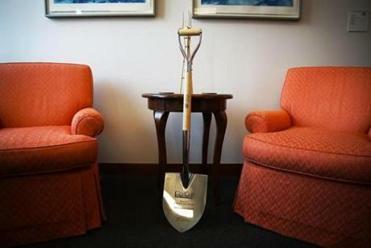 The shovel used for the groundbreaking of the WBUR and Martin's Park rests in the office of Jim Canales, president of The Barr Foundation. Shovels from groundbreaking events. Barr doesn’t usually give out money for capital projects, but it has been a major supporter of Martin’s Park and WBUR radio’s CitySpace. Barr donated $3 million to help build and maintain a park by the Boston Children’s Museum named in honor of Martin Richard, the Boston Marathon bombing’s youngest victim. The project broke ground last August and is on track to be done in November. Barr gave $2 million to create CitySpace on the Boston University campus on Commonwealth Avenue, where WBUR will host live radio programs, cultural events, and discussions. The project — part of the station’s strategy to broaden its reach online and in person — broke ground in March and is expected to be completed next year. “It’s really about what we see as a catalyst for new thinking,” says Canales, who is also a Barr trustee. Work Space is a new column about where people work, why the space suits them, and what it reveals about their lives and philosophies. It can be anything from a CEO’s dazzling suite to a cool startup to a cramped temporary office to a communal work area. If you’ve got a candidate, send an e-mail to business@globe.com, and put “Work Space” in the subject line. Replica of a rapid transit bus from Mexico City. Two years ago, Barr led a delegation of Boston business, civic, and community leaders to check out Mexico City’s rapid transit bus system. 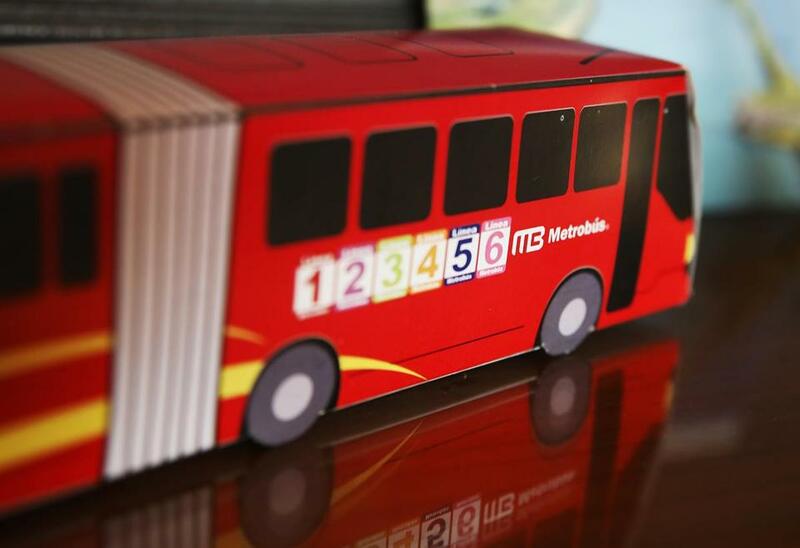 BRT, as it is known, is a system that optimizes travel by offering, for example, exclusive lanes for buses, pre-paid fare collection, and signal synchronization. Boston has a long way to go on creating a BRT system of its own, but parts of Everett and Roslindale have rolled out bus-only lanes during the morning commute to speed up service. A Rapid Transit Bus replica sits on a desk in the office of Jim Canales, president of The Barr Foundation. A teacher’s bell. Canales started out as a high school English teacher before becoming a nonprofit executive. The bell was a gift from the board of the San Francisco Day School, an independent K-8 school in San Francisco, where Canales served on the board from 1996 to 1999. Education is also one of Barr’s major grant areas. “It reminds both of the experiences as a teacher and the work we do at Barr,” he says. Due to a reporting error, an earlier version of this story incorrectly described artist Nari Ward’s “mass action.” The Barr Foundation did not commission the piece of art.